You will have to apply Newton’s Laws of Motion in different branches of Physics, but you will find questions specifically meant for checking your understanding of these laws in AP Physics Examination, Graduate Record Examination (GRE) and Medical and Engineering Entrance Examinations. The area under the force-time graph gives the impulse imparted to the particle. Impulse is a vector quantity and so you must consider its sign while adding the areas. The impulse received from zero to 2 seconds is positive and is equal to the area of the triangle, which is 6 Ns. The impulse received during the time from 2 s to 4 s is the area of the rectangle, which is – 6 Ns. The impulse received during the time from 4 s to 8 s is the area of the larger rectangle, which is 12 Ns. Hense the net impulse received during the time from zero to 8 seconds is 6 –6 +12 = 12 Ns. Since the impulse is equal to the change of momentum, the correct option is (c). 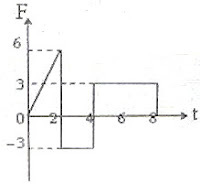 We have force F = dp/dt where ‘dp’ is the change in linear momentum during the time dt. The initial momentum of the ball is 0.2×30 = 6 kgms–1 and the final momentum is zero so that dp = 6. Therefore, F = 6/0.1 = 60 N.
If the mass of the projectile is ‘m’, the mass of each fragment after the explosion is m/2. The momentum of the part which moved upwards is (m/2)×30 =15m. This is shown as vector OA in the figure. 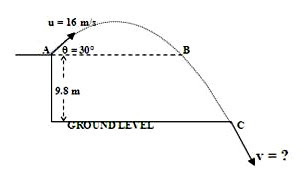 The momentum of the projectile at the highest point of its path is 20m and its direction is horizontal. This is shown as vector OC. The momentum of the other part (after the explosion) is (m/2)×v where ‘v’ is its velocity. This is shown as vector OB in the figure. Since the momentum is conserved, the total final momentum, which is the vector sum of the momentum vectors OA and OB must be equal to the initial momentum, represented by the vector OC. Evidently, OB = √(OA2 + OC2). Or, mv/2 = √[(15m)2 + (20m)2] = 25m. This gives v = 50 ms–1. Q = Flux change/Resistance = nAB/R where ‘B’ is the magnetic flux density and ‘n’, ‘A’ and ‘R’ are respectively the number of turns, area and the resistance of the search coil. Therefore, Q = [10× π(0.01)2×2]/0.1 = 0.02 π coulomb. I = Q/t = 0.02 π/0.1 = 0.2 π ampere. 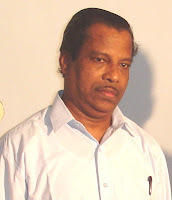 There is no change in the magnetic flux linked with the loop and hence the net emf acting in the whole loop is zero. But, since all the conductors AB. AC and BC are moving in a magnetic field, cutting the magnetic field lines, the free charge carriers in them experience magnetic force (Lorentz force) and get shifted towards their ends . So, there are electric fields in all these conductors (generally). In other words, there are induced voltages across AB, AC and BC, but the net voltage in the whole loop is zero since the voltage across AB is equal and opposite to the net voltage across the series combination of AC and BC. A special case is the possibility of the triangle to be right angled at A or B. If the triangle is right angled at A, the electric field induced across AC is zero. If the triangle is right angled at B, the electric field induced across BC is zero. But the most suitable choice in the above question is still (d). If you have mastered the basic points in electromagnetic induction, you will be able to answer the above questions in a couple of minutes. Try. I’ll be back shortly with the solution. In the above situation, a current is induced in the ring which interacts with the horizontal component of the magnetic field to produce an average force in the upward direction. Statement-1 is true. But statement-2 false[Option (c)]. When the magnetic flux linked with the ring increases because of the increase of current in the coil, the ring will be repelled in accordance with Lenz’s law, so as to oppose the increase of flux through the ring. When the current through the coil decreases, the flux linked with the ring decreases. In this case, the ring will be attracted towards the coil, so as to oppose the decrease of flux through the ring. Since the coil is fed with an alternating current, these actions are repeated successively and the ring can therefore float above the coil. The ring floats because of Lenz’s law. Basically it is the result of the interaction of the magnetic field produced by the induced current with the magnetic field produced by the coil, but the magnetic field produced by the coil is along the vertical (through the iron rod) and is not horizontal. 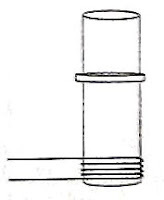 The vertical field produces the flux and the change of flux through the ring and this is responsible for the floating of the ring. (i) Transverse waves only can be polarized (Longitudinal waves cannot be polarised). (ii) The proof for the transverse nature of light is the exhibition of polarisation by light. At the highest point of the trajectory, the velocity of the projectile is horizontal and is equal to ucosθ = 10 cos 60° = 5 ms–1. Since the collision is elastic and the spheres are identical, the sphere A transfers its entire momentum to sphere B. Sphere B therefore moves with the same horizontal velocity of 5 ms–1. On substituting for the acceleration due to gravity, g (=10 ms–1), R = 0.5 m = 50 cm. 7 t = 0.25 n where ‘t’ is the time taken to hit the edge of the nth step after leaving the top of the stair case. Two dimensional motion is the combination of two independent one dimensional motions at right angles. The following MCQ can be easily answered if you are aware of this. The horizontal and vertical components of the velocity when the stone strikes the ground at C are to be found. The magnitude and direction of the velocity can then be obtained. ux = vx = u cosθ = 16 cos30° = 8√3 ms–1. vy 2 = 82 + 2×(–9.8)×(–9.8), making use of the standard relation v2 = u2 + 2as. Therefore, vy2 = √(256.08) so that vy = ± 16 ms–1. You have to take the negative value since vy is downwards. Therefore, vy = – 16 ms–1. v = √(vx2 + vy2) = √(8√3)2 + 162) = 21 ms–1, approximately. The velocity ‘v’ is at an angle of tan–1(vy/vx) = tan–1(–16/8√3) with respect to the horizontal. So, the angle is tan–1(–2/√3) and the correct option is (b). The following question will be quite simple if you remember the basic things in circular motion and elastic collisions ( and of course projectiles). Many among you will be able to work this out easily. Once you have prepared thoroughly for an examination like the AP Physics Exam or a Medical and Engineering entrance Exam, you will be able to get the answer in less than a couple of minutes! I will be back with the solution shortly, but try your best. The following question is in continuation of yesterday’s question on electromagnetic induction. In fact I had tried to post it yesterday itself but there were some technical problems. When the current in the solenoid increases, the magnetic flux linked with the ring will increase. This increment in magnetic flux produces an induced current in the ring. By Lenz’s law, the system has to oppose this. The ring and the solenoid will try to move away so that the magnetic field at the ring and the flux through the ring are reduced. So. there is a repulsive force in this case [Option (c) is the correct one]. You can find additional typical multiple choice questions (with solution) on electromagnetic induction by clicking on the label ‘electromagnetic induction’ either below this post or on the side of this page (or any page). This question appeared in IIT Screening 2004 question paper. When the magnet is moved towards the coil, the magnetic flux linked with the coil goes on increasing and the magnitude of the induced emf goes on increasing as long as the rate of increase of flux is increasing. The rate of increase of flux then has to decrease and hence the magnitude of the induced emf decreases. The rate of increase of flux then becomes zero. Thereafter, the rate of decrease of flux becomes greater and greater, becomes a maximum and then becomes smaller and smaller and finally reduces to negligibly small value. The induced emf therefore follows these variations in the opposite direction (since it is the rate of decrease of flux that occurs now). 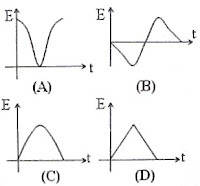 The variation of emf is therefore given by curve (B). The magnetic dipole moment of a current loop is iA where ‘i’ is the current and ‘A’ is the area of the loop. The rotation of the rod OP with linear charge density λ from its middle to the end P is equivalent to many current loops of varying area. Considering the current loop made by the charge λdr on a small length dr of the rod at distance ‘r’ from the end O, the magnetic moment contributed by it is (λdr/T)×πr2 where T is the period of rotation of the rod. Since T = 2π/ω, the above magnetic moment is ½ (λωr2dr). The magnetic dipole moment (m) due to the rotation of the entire rod is obtained by integrating the above between the limits L/2 and L.
Therefore, m = ∫[½(λωr2dr) = ½(λω)×[L3/3 – (L/2)3/3] = 7λωL3/48. T = 2π√(I/mBh) where ‘I’ is the moment of inertia of the needle (about the axis of angular oscillation, which is through its centre of mass and is perpendicular to its length.) and ‘m’ is its magnetic dipole moment. T’ = T/√(tan30º) = T/√(1/√3) = T×31/4. I give you two questions (MCQ) from magnetism without solution. See whether you can work out these within five minutes. I’ll be back shortly with the solution.